If you’ve been following our blogs in recent months, you will know that both Saskatchewan and Alberta are planning significant increases in renewable energy production over the next decade. As discussions on new wind energy projects gain more public attention, farmers and other landowners are beginning to ask questions about what impact wind farms will have on their land, livestock and crops. The Canadian Wind Energy Association (CanWEA) recently developed a new land use fact sheet to discuss the integration of wind energy facilities into the landscape and existing land uses, as well as the opportunities for landowners participating in a wind energy project. Some highlights are provided below. Although wind turbines are large structures, they are relatively small at the base. The average turbine measures just eight to 10 metres across at the foot of each tower. Turbines are typically spaced between 250 and 800 metres apart. Sometimes they may be spaced further apart depending on the requirements of the turbine model or other technical design issues. The result is that the overall land use and footprint impact of wind farms is minimal. When you consider the space devoted to towers, substations and access roads it is estimated that wind farms displace only five per cent of the land found within the entire wind farm. For farmers, this means that crops can continue to be planted right up to the base of turbines, and they can be harvested with the usual farm machinery. For ranchers, it means that livestock can continue to graze on land in and around the towers, even while the tower is in operation. 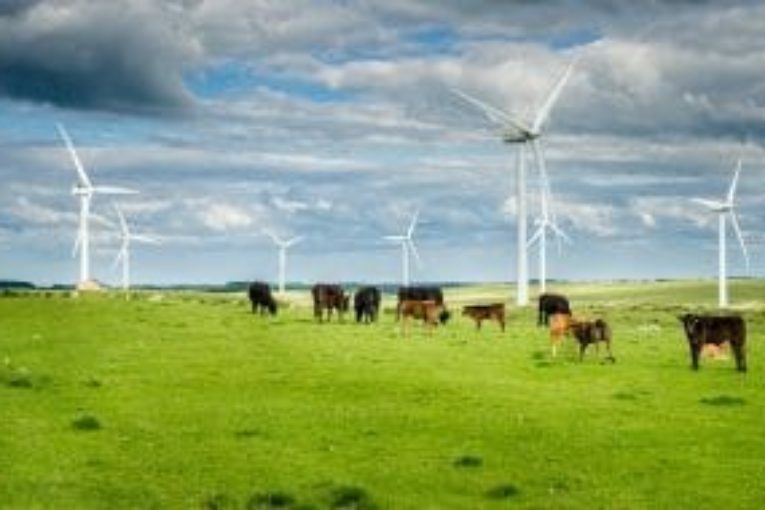 Wind energy offers a unique opportunity to deliver stable financial rewards with little or no effort on the part of landowners. Since landowners lease their land to energy companies who build and run the wind farm, they can earn money without having to expend a lot of time, energy or capital themselves. Beyond the leaseholders, rural communities enjoy the many economic and social benefits of wind energy that are returned through municipal tax revenues and the creation of high-value jobs that provide employment opportunities for local tradespeople and contractors during the construction phase, as well as full-time permanent jobs once the wind farm is operational. Wind projects also bring an infusion of dollars to local services and businesses. As more wind energy projects pop up in Alberta, in Saskatchewan, and in other regions of Canada, CanWEA is working to establish a strong foundation for meaningful dialogue, while supporting an atmosphere of public trust, between wind energy developers and communities interested in hosting wind energy projects. We invite you to check out the new fact sheet, Wind Energy and Land Use – an Advantage for Landowners and Communities and share it in your communities.